Aims: To detect the causes of poor visual outcome among patients who had extracapsular cataract extraction and intraocular lens (IOL) implantation. Materials and Methods: All patients who had ECCE and IOL implantation 6 weeks or more following surgery and who come for regular follow-up were picked from the Statistical Department and assessed for visual acuity, and for those with poor vision uncorrectable with glasses or any other mean of correction, complete ophthalmic examination including pupillary reactions measurement of intraocular presser (IOP) and direct and indirect ophthalmoscopy was performed. Results: Most of the patients were elderly (74%) and females were slightly more than males. The predominant type of cataract was senile cataract, 89% of patients complained of poor vision, 35% with visual acuity after operation less than 6/60 represent the biggest group with poor vision. Concerning intraocular pressure, the majority of pseudophakic eyes had normal range of IOP (75%), while 25% of the study group had raised intraocular pressure, although some of the patients with normal tension showed signs of advanced glaucomatous optic neuropathy. The most common causes of poor vision in the anterior segment were: Posterior capsule opacification (24%), corneal edema, opacity, pannus and bullous keratopathy (23%), amblyopia (6%), IOL decentration (5%), squint (4%), intraocular scarring (3%), nystagmus (2%), shrunken eyes (2%) and epithelial down-growth (1%). 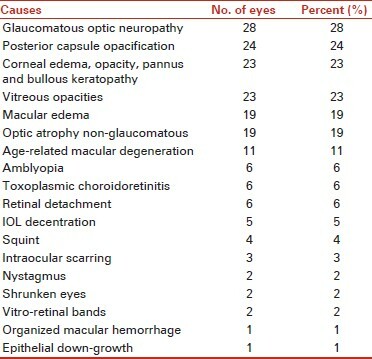 The most common causes of low vision in the media and posterior segment were glaucomatous optic neuropathy (28%), vitreous opacities (23%), macular edema (19%) and optic atrophy non-glaucomatous (19%), age-related macular degeneration (11%), toxoplasmic choroidoretinitis (6%), retinal detachment (6%), vitro-retinal bands (2%) and organized macular hemorrhage (1%); in some eyes, more than one cause was detected. Conclusion: The most common contributory factors for poor vision were incomplete ophthalmic examination before surgery, poor case selection and incomplete and irregular follow-up besides the above-mentioned causes. Purpose: To compare two different methods of determining the post-operative position of the toric IOL and to calculate the alignment error with each method. Setting/Venue: Cataract and Intraocular Lens Implantation Service, Shroff Eye Center, New Delhi, India. Design: Case series Materials and Methods: Eighty-nine eyes of 61 patients with cataract and co-existing corneal astigmatism ranging from 1 to 4 diopters planned for toric IOL implantation were included. All eyes underwent pre-operative automated keratometry and biometry. Toric IOL cylindrical power, axis of implantation, and anticipated residual astigmatism were calculated using the web-based Acrysof Toric calculator. 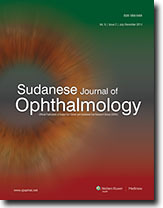 All eyes underwent pre-operative reference marking to denote the 0° and the 180° positions (using bubble marker) followed by digital slit-lamp photography. All eyes were operated by the same surgeon, at the same incision location. At 3 months, the achieved IOL alignment was analyzed by aligning the slit-beam of the slit-lamp with the pair of marks denoting the axis of the IOL after pupillary dilation. Additionally, the IOL position was determined after capturing a digital retro-illuminated slit-lamp photograph, which was superimposed on the pre-operative photograph using single prominent major episcleral vessel around the limbus as landmark. The axis of orientation of the toric IOL was determined using tools in Adobe Photoshop (version 7.0) by aligning a line through the marks denoting the IOL axis. The amount of alignment error (in degrees) by both methods induced with respect to the desired axis of alignment was calculated and statistically analyzed. Results: The mean pre-operative keratometry was 44.19 ± 1.51 D, and the mean corneal cylinder was 2.54 ± 0.90 D. The mean post-operative absolute cylinder was 0.57 ± 0.28 D. Toric IOL models used were T3(1.03 D): 28 eyes (31.5%), T4(1.55 D): 21 eyes (23.6%), T5(2.06 D): 18 eyes (20.2%), T6(2.57 D): 11 eyes (12.4%), T7(3.08 D): 4 eyes (4.5%), T8(3.60 D): 4 eyes (4.5%), and T9(4.11 D): 3 eyes (3.4%). Mean post-operative alignment error was 3.44 ± 2.60 D by the slit-lamp method and 3.89 ± 2.86 D by the Photoshop method with no significant difference seen between the two methods (P = 0.384). Fifty-six eyes (62.9%) by the slit-lamp method and 52 eyes (58.4%) by the Photoshop method had rotation error ≤ 5 degrees (P = 0.526), and 78 eyes (87.6%) by the slit-lamp method and 75 eyes (84.3%) by the Photoshop method had rotation error ≤ 10 degrees (P = 0.422). Conclusions: Both Adobe Photoshop method and slit-lamp observation were reliable and predictable methods of assessing IOL alignment. Although the sensitivity is more with the Photoshop method, the slit-lamp method is more accessible in an outpatient setup. The clinical outcome following toric IOL implantation can be refined by reducing the alignment error, which is dependent on an accurate keratometry and biometry, surgeon-specific SIA, reference and intra-operative marking, and finally, placement of IOL in the bag. Objectives: The objective was to assess the effect of fasting on the intraocular parameters. Materials and Methods: A total of 114 subjects enrolled in this study. The method included was the measurements of the keratometry readings, axial length, anterior chamber depth, lens thickness, vitreous thickness, and calculation of intraocular lens (IOL) power. These measurements were done twice at first while the patient is in the fasting state and second while the patient is in the fed state. Result: No change occurred in keratometry readings, lens thickness or vitreous thickness. The axial length decreased by 0.251 mm in the fasting state while the anterior chamber depth was 0.165 mm shorter. Furthermore, the power of IOL calculated by Sanders, Retzlaff, and Kraft formula was found to be increased by 1 D in the fasting state which was found to be statistically significant. Conclusion: Measuring the intraocular parameters for a patient who is in the fasting state will result in a shorter axial length and higher IOL power so care should be taken when measuring the intraocular parameters for a patient who is in the fasting state. Purpose: To report a rare presentation of metastatic neuroendocrine tumor in the orbit. 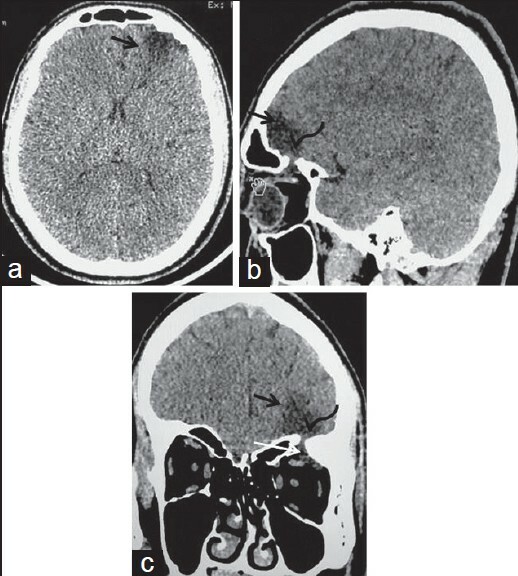 Case report: A 43-year-old female presented with a left painful proptosis of 4 days duration associated with nausea and vomiting. There was a history of multiple liver metastases from an unknown primary carcinoid tumor for 7 years. Ocular examination revealed severe eyelid swelling associated with conjunctival injection, chemosis and complete external ophthalmoplegia. The visual acuity was 20/20 in right eye and no light perception in left eye. 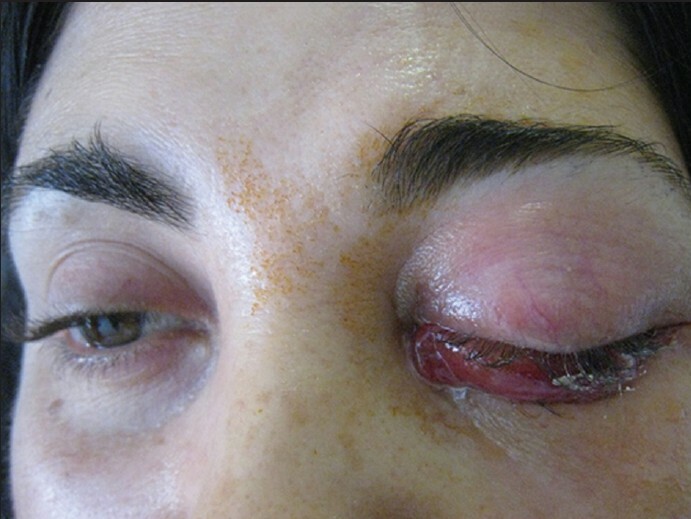 The initial clinical diagnosis was orbital cellulitis with optic nerve compression. Orbital imaging showed gross enlargement of left lateral rectus muscle with optic nerve compression consistent with a carcinoid metastasis. Surgical resection of the tumor mass along with the involved muscle was performed. Histopathology confirmed the diagnosis of neuroendocrine (carcinoid) tumor infiltrating fibro fatty tissue and skeletal muscle with widespread necrosis. On Immunohistochemical staining the tumor cells were positive for chromogranin A, synaptophysin and cytokeratin. Post-operative external beam radiotherapy (EBRT) and systemic chemotherapy were given. Conclusion: Acute necrosis in metastatic orbital carcinoid tumor can lead to orbital inflammation which could mimic orbital cellulitis. Systemic history and orbital imaging play an important role in differentiating the infective etiology from metastasis.